Scientists have been watching events taking place in a small medieval town, L'Aquila, Italy, unfold for about three years, and the world took notice yesterday when six scientists and one civil servant were convicted of manslaughter and sentenced to six years each in jail, and a total of over three million dollars in fines, amongst other penalties. This verdict came only a week after it was discovered by the Canadian environment ministry discovered that a California businessman more-or-less secretly spread 100 tons of iron dust into the ocean off western Canada to increase the growth of plankton to increase the salmon fishery. Something is changing in the relation between science, scientists, and members of the general public. 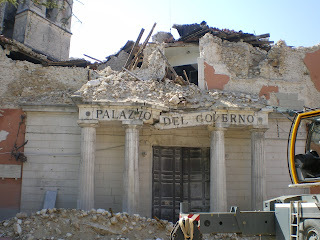 Because of the escalating tension, six scientists and one government official, members of the Serious Risks Commission, were hastily, were called to a one-hour meeting in L'Aquila with the goal of furnishing the residents "with all the information available to the scientific community about the seismic activity of recent weeks". From here on, events are complicated, and the reader should see the account referenced below for details. Briefly, the government official reported to the public after the meeting that the scientists had said the seismic situation posed "no danger", a point of contention throughout the trial. The scientists appear, in fact, to have said that the probability of a large earthquake was small, but that it was possible. Whatever the details, the residents of L'Aquila said that they felt reassured by the message conveyed and therefore, according to their account, did not follow the age-old tradition when the tremors continued, but remained in their houses. On April 6, an earthquake struck, tragically killing 309 people. A year later, the six scientists and government official were charge with involuntary manslaughter for being negligent in giving advise on the risk to public safety. Note: they were not accused of failing to predict the earthquake as many news reports continue to assert. Yesterday, the judge handling the case convicted the seven on the charges and handed down a jail sentence that was 50% longer than requested by the prosecution. It may be three months before the logic behind this sentence is revealed. According to Italian law, the sentence can be appealed, and the seven will not be jailed unless the appeals fail. The scientific community is in shock, especially the geologic community and those who work with hazards, risk management, and public safety, but there are obvious parallels running through other communities, such as the medical community. Scientists are already becoming wary of existing communication protocols, even in countries like the U.S. where much thought and experience, both in earthquake and volcanic hazards, has gone into defining how the interface between science and the public is addressed. As I wrote this, an announcement appeared on the WWW that the head of the Major Risks Committee in Italy and several of its top scientists have resigned saying that there are no longer good working conditions. There is a real danger that public safety will be compromised as scientists become afraid that any comment they make can put them in jeopardy of prosecution. I join with my many colleagues around the world in condemning the verdict--it helps neither the victims, nor potential victims of future events, nor those who try to ameliorate the effects of natural hazards and keep them from turning into disasters. But, I would like to ruminate on something else (since this is a rare diversion of my posts from pure science). Although it may seem unrelated, a story just reported last week initially by the Guardian, and then by the New York Times, raises concerns that are not entirely unrelated. Just as the convening of the meeting of the Serious Risks Commission was precipitated by the activity of a member of the general public, in this case a California business man, Russ George, has precipitated environmental concern because of a geoengineering experiment. Geoengineering is an activity in which human intervention (the engineering part of geoengineering) is used in a large-scale attempt to alter the natural balances of the planet (the geo- part). The pros and cons of geoengineering are an issue of active debate in the scientific community. There have been carefully designed, peer-reviewed, small-scale geoengineering experiments of the kind that George performed, but this one was apparently carried out in secrecy, without peer review of the procedures, nor, apparently, a statement to the community of environmental impact. The argument that the experiment took place outside the territorial waters of Canada is a red herring. George was reportedly paid $2.5 million by the Haida people of northern British Columbia, to scatter 100 tons of iron dust in the Pacific off the coast of northwestern B.C. The Haida have relied for centuries on the salmon runs, and have been suffering after the crash of salmon nurseries in the Pacific. Their waters are depleted in iron, and the addition of iron in this experiment spurred growth of the plankton. Since plankton absorbs carbon dioxide and then dies and falls to the bottom of the ocean, it is one proposed scheme for burying atmospheric carbon. The Haida apparently hoped that in addition to increasing the salmon fishery, they could take advantage of carbon offset credits. The problem with this experiment, and with many geoengineering proposals in general, is that if the experiments go awry, the can endanger the planetary system at a very large and potentially catastrophic scale. The so-called "precautionary principle," under which many European countries operate, states that if a given action has the potential for harm, even in the absence of scientific consensus that the action is harmful, the burden of proof that it is not harmful rests on those taking the action. That is, potentially harmful actions should be avoided. These seemingly unrelated cases bring a few points to attention. Each one involves an area of science (earthquake prediction; ocean fertilization) getting a lot of attention from scientists and policy makers. Considerable thought has been put into protocols, transparency and accountability for work in the subject. There are methods for testing hypotheses and for dissenting with the prevailing paradigm: data are gathered and tested according to principles long established by the scientific method. Such visible issues attract a variety of people, including some ill-trained in scientific methods. In these two cases, there was/is a person operating outside the bounds of these methods and outside the protocols that have been established for use of the information. Scientists holler that either data do not support the rogue claim (the situation with radon and earthquakes and with previous ocean fertilization experiments), or that the design of the experiment and its results are not subject to scrutiny (the case with the current rogue fertilization experiment). In either case, the public is often subjected to ambiguous and contradictory opinions and recommendations. Continuous communication of data to the public and education of the public about the issues are necessary. Only in this case will individuals have the skills and then the resources to make informed decisions, to elect informed officials, and to evaluate both data and advice provided. In L'Aquila, such procedures should have led to improvements in construction and reenforcement of buildings; that did not happen. In the case of ocean fertilization, this should lead to an informed public that can decide if massive geoengineering practices should be attempted. Some established procedures are better than others. Clearly there were flaws in the way that events were handled at L'Aquila. 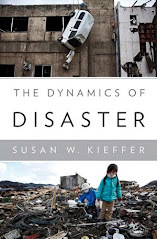 But even in places like the U.S. earthquake and volcanology programs where considerable thought has been given to crisis procedures, there are likely to be flaws that will be revealed when the system is stressed. Those who acted in good faith to establish the procedures, and those who work within the system acting with integrity, should not be made scapegoats when these flaws are revealed. It is imperative that failures be used to improve the system so that it will be better when the next situation arises. The relations between scientists, policy makers, and the public are changing, some even saying that that the L'Aquila trial is a "watershed case." (Tom Jordan, director of the Southern California Earthquake Center). Geoengineering may be a L'Aquila of the future.